Every since we moved to Southern Texas last summer we have marveled at the low price and selection of citrus fruit available to us. On our early house hunting trips we used to fill any extra space in our suitcases and bags with as much citrus fruit as we could to bring back to Indiana. I vividly remember a trip to a Central Market where I bought about 10 different kinds of citrus fruit of which 8 of them I had never tried before so it was very exciting for me. Now 8 months later we are still going through a large bag of grapefruit and oranges each week. By a large bag I mean about 15 pounds of just grapefruit and another maybe 8-10 lb bag of oranges. My husband likes to peel and eat his grapefruit but I much prefer to have a glass of freshly squeezed juice. We have been looking for a juicer for months now and my husband has been enamored with the manual citrus presses he sees everywhere in Mexico. I recognized that those presses are made just for oranges and can be very messy when you try to use larger or smaller citrus on it. I wanted something more flexible and less messy. While doing some research last weekend I happened upon the Cuisinart CCJ-500. I had seen a couple mechanical citrus juicers and their prices were way more than I wanted to spend ($200-400) and their designs looked like they would be a pain to keep clean. The price on this model was certainly right at $30 and the design looked like it would be simple to use and to more importantly easy to clean. My juicer arrived today and I headed straight to the kitchen with it. I had a whole basket of grapefruit and oranges waiting for me. Once I got it all unpacked I did the womanly thing and read the fine manual to make sure it was really as simple as it looked. I think it may have been simpler. I was annoyed by one thing about this model and that was that the unit is shorter than I had imagined since most reviews said it was good and tall. I guess your not really suppose to drink tall water glasses full of juice so that is why it is built for slightly shorter glass or in my case a plastic cup because all my glasses were too tall. Other than the height issue I love the ease of use. I was able to basically leave just an empty rind without any real effort on my end. You just push gently down and give the fruit a gentle squeeze and the machine does the work, including switching direction of the reamer. When your done and you have all that juicy pulp just sitting there you put on the lid and give it a push and it spins fast enough to separate your juice from pulp. After you get your juice you just flip up your spout and lift the top of the unit off and just take the entire thing to the sink without any dripping. I had read some negative reviews about the cleanup but I knew from my experience with a grinder/juicer that juicers that they just aren’t extremely cleanup friendly. If you wash them immediately with a quick rinse and just a once over with a soapy sponge you can be done in a minute or two but if you wait an hour or so you will at least double your cleanup time. 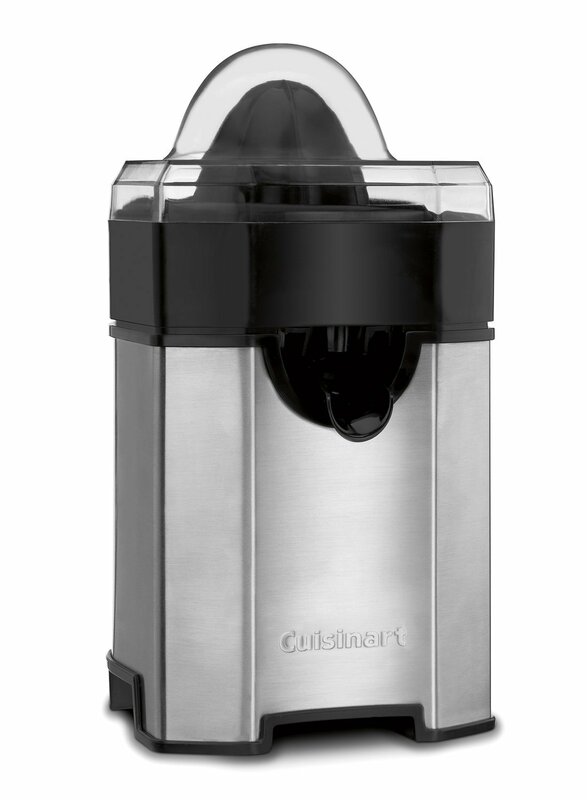 Overall the Cuisinart CCJ-500 is a very good unit with a strong motor, a good price and my only wish for it would be for it to be a bit taller.